Hand Carved Wine Barrel Heads - Wine Art Gallery. This French Oak Barrel features the Cooperage brand and seal. 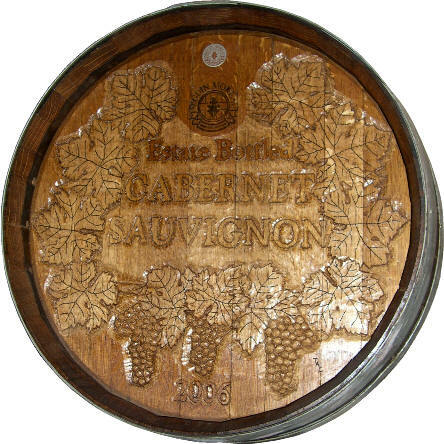 This is one of the barrels carved for Tom's booth at Wineries Unlimited 2006. A deep head, the grape leaves became extremely tricky to carve near the edges. PayPal automatically adds a small shipping charge. On this piece, we will cover the balance - shipping UPS Ground insured. If you prefer Next Day, Two Day or Three Day on this item please e-mail Tom immediately after purchase! For more information on a custom Wine Barrel Carving, visit our Wine Barrel Carving page! Or go straight to our Wine Barrel Carvings Commission Information page! About Us l Order Information & Privacy l What's New?